Calling all you cross-country ski bums! Join Women Outdoors for our Annual Cross-Country Ski Weekend at the Craftsbury Outdoor Center in the heart of Vermont’s unspoiled Northeast Kingdom on March 15-17, 2019. 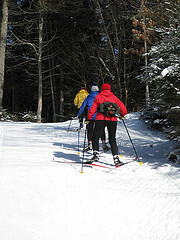 This amazing weekend features 3 days and 2 nights of cross-country skiing, snowshoeing, ice skating and socializing. Accommodations, all meals and cross-country touring tickets are included. Women Outdoors members from all regions are encouraged and welcome to attend this event. Spend the day exploring Craftsbury’s myriad Nordic trails and enjoying the best snow in the Northeast. Whatever your skill level, there’s a trail for you. Green, blue and black trails offer stunning beauty and great exercise. 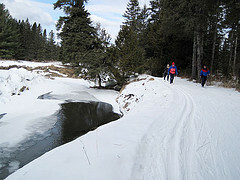 If you prefer, snowshoeing and ice skating await you. Bring your own snowshoes and/or cross-country ski equipment or rent from Craftsbury for a nominal fee. You can also sign up for a massage after a day on the trails. Friday evening starts with a delicious dinner at 6:30, usually followed by games and fun in the lodge while we watch friends new and old come wandering in. 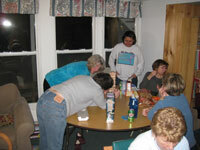 Bring your favorite DVDs, board games and stories for evening entertainment. There is a TV room for our use and also a heated yurt with a pool table, ping pong and Foosball. Unlikely champions seem to arise out of the mist here. Accommodations are dormitory style double rooms, which allows us to offer great discounted pricing. Women Outdoors has reserved eight double rooms (twin beds) plus four single occupancy rooms, for a total occupancy of 20. Make your reservations early! The restroom and showers are shared on each floor. Bedding and towels are provided. There is a self-serve sauna with extra showers and towels. The Craftsbury Outdoor Center prepares delicious meals with both vegetarian and non-vegetarian options. The variety and fresh local ingredients are just fabulous. Gluten-free and other specialties are available with advance notice. Coffee, tea and snacks are generally available all day. There is a refrigerator and microwave in the lodge for day/evening use. You may bring your own alcohol, which is permitted in both the lodge and dining area. 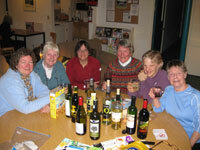 The Women Outdoors Annual Cross-Country Ski Weekend at Craftsbury is for Women Outdoors members only. If you are not yet a member, you can join now or renew your membership. There is a minimum two-night stay – Friday and Saturday, March 15-17, 2019. Your meals from dinner on Friday night to Sunday lunch are included as well as cross-country touring tickets for the weekend. Payment in full must be received by Monday, February 25, 2019. In the unlikely event that you need to cancel your reservation, if you cancel at least 14 days in advance of the ski weekend i.e. by Friday, March 1, 2019, you will only forfeit $25. For cancellations within 14 days of the ski weekend, there will be no refund. 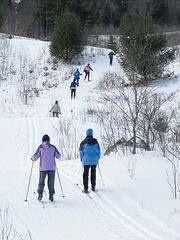 Please note: The Craftsbury Cross-Country Ski Weekend is for Women Outdoors members only. If you are not a member, please join now or renew your membership!